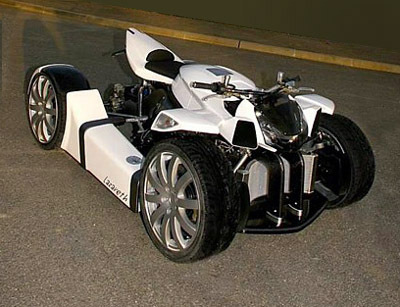 The Quadrazuma is a French made road-going quad bike from renown custom bike builder Lazareth. Powered by a 1 litre Yamaha sports bike engine, the Lazareth Quadrazuma has 120 horsepower to play with. This equates to a 125 mph top speed and blistering acceleration. 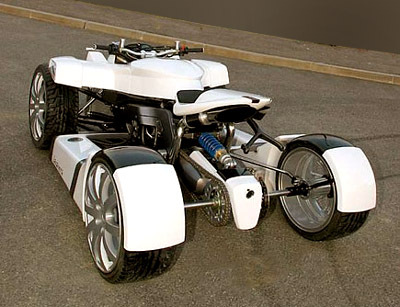 Although due to power restrictions for road-legal quad bikes the Quadrazuma is limited to just 20 horsepower. The Quadrazuma has a tubular chassis and a steering mechanism lifted from the Renault Twingo. Most of the other components come from various superbikes; the front brake comes from the Yamaha MT-01, the rear brake from the Yamaha R1, and the headlight comes from the Honda CBR. The carbon-fibre bodywork is well thought out and it looks like a factory produced machine. The enormous 17" alloy wheels are exposed at the front and covered by discreet guards at the rear. Total weight of the Quadrazuma is just 380 kgs (837 lbs).